Dimmers are devices which are designed to control the light output and by adjusting (low or high) its brightness. The dimmers were used to dime the brightness of incandescent, fluorescent bulbs, and halogen lamps etc. But now you can control the output of even LEDs with these devices. Before you think you can control the output of every LED, just hang on there. Dimmers can only control the brightness of Dimmable light bulbs only. 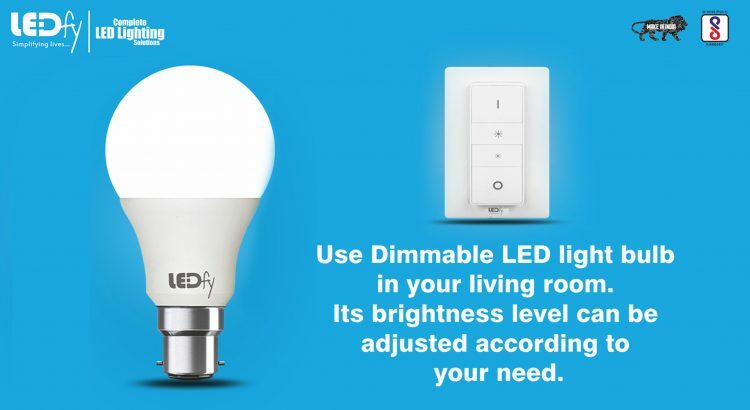 The Dimmable light bulbs can perfectly work on the circuits where dimmers are not installed it’s just that they won’t dim. The non-dimmable luminaries can’t be controlled by Dimmers. Even if you want to forcefully control the non–dimmable lights, you will end up damaging the electronic circuits and the ballasts (in case of other lights) or circuit driver (in case of LED bulbs). This way the light fixture will be damaged, you can experience the flicker of lighting as well. As mentioned above, a dimmer can control the light output and brightness of an LED bulb. You can adjust the intensity of light according to your mood and at any time. There’s no restraint on the number of times you can dim a light. On Contrary to your physical comfort, it is also beneficial for your wallet as it can save electricity and increase the life of the lamp. The more you dim the brightness the more electricity you save. Is Selecting a Dimmer a simple process? It has been a very simple task to select a dimmer for home or business purpose. But the lighting technology has witnessed many updates over the last few years that have made this task a little complicated. At first, we had to select from a few choices available for this but now it takes many considerations to do so. The type of light, the load of wattage, single or multi-place and the style of the dimmer, these are the prime factors which come to play before selecting the right one for maximum energy-efficiency. Can Multi-luminaires be used with Dimmers? Yes. Dimmers are developed with maximum load rating based on a number of Volts or Watts or Amperes. This load rating is used to determine how many light fixtures can be controlled by that dimmer without any risk of potential danger. As all dimmers have ratings according to the load they can hold, in case of LED lights, it doesn’t work that way. LED load is calculated by the implying of 1/10th of the rating of the dimmer. If you are buying a dimmer with the rating of 500W you can use a combination of LEDs up to 50W which suggest you can run five 10W LED bulbs with one dimmer.